Draft: 2008, Florida Marlins, 3rd rd. November 6, 2017 LHP Edgar Olmos elected free agency. June 29, 2017 Pawtucket Red Sox activated LHP Edgar Olmos from the temporarily inactive list. June 25, 2017 Pawtucket Red Sox placed LHP Edgar Olmos on the temporarily inactive list. 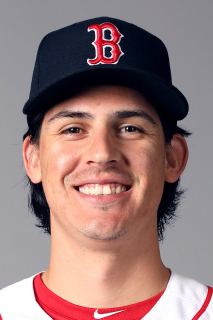 December 20, 2016 Boston Red Sox invited non-roster LHP Edgar Olmos to spring training. November 16, 2016 LHP Edgar Olmos assigned to Pawtucket Red Sox. November 15, 2016 Boston Red Sox signed free agent LHP Edgar Olmos to a minor league contract. November 7, 2016 LHP Edgar Olmos elected free agency. August 31, 2016 Norfolk Tides activated LHP Edgar Olmos from the temporarily inactive list. August 26, 2016 Norfolk Tides placed LHP Edgar Olmos on the temporarily inactive list. August 19, 2016 Norfolk Tides activated LHP Edgar Olmos from the temporarily inactive list. August 16, 2016 Norfolk Tides placed LHP Edgar Olmos on the temporarily inactive list. May 31, 2016 LHP Edgar Olmos assigned to Norfolk Tides from Bowie Baysox. May 30, 2016 LHP Edgar Olmos assigned to Bowie Baysox from Norfolk Tides. April 1, 2016 LHP Edgar Olmos assigned to Baltimore Orioles. March 26, 2016 LHP Edgar Olmos assigned to Norfolk Tides. March 24, 2016 Chicago Cubs traded LHP Edgar Olmos to Baltimore Orioles for Player To Be Named Later. February 16, 2016 Chicago Cubs sent LHP Edgar Olmos outright to Iowa Cubs. February 12, 2016 Chicago Cubs designated Edgar Olmos for assignment. December 23, 2015 Chicago Cubs claimed LHP Edgar Olmos off waivers from Baltimore Orioles. December 10, 2015 Baltimore Orioles claimed LHP Edgar Olmos off waivers from Chicago Cubs. December 4, 2015 Chicago Cubs claimed LHP Edgar Olmos off waivers from Seattle Mariners. December 2, 2015 Seattle Mariners designated LHP Edgar Olmos for assignment. October 5, 2015 Seattle Mariners recalled LHP Edgar Olmos from Tacoma Rainiers. September 7, 2015 Seattle Mariners optioned LHP Edgar Olmos to Tacoma Rainiers. August 17, 2015 Seattle Mariners recalled Edgar Olmos from Tacoma Rainiers. May 30, 2015 Tacoma Rainiers activated LHP Edgar Olmos. May 30, 2015 Tacoma Rainiers placed LHP Edgar Olmos on the temporarily inactive list. May 20, 2015 Seattle Mariners optioned LHP Edgar Olmos to Tacoma Rainiers. April 3, 2015 Edgar Olmos roster status changed by Seattle Mariners. March 5, 2015 Seattle Mariners activated LHP Edgar Olmos. February 24, 2015 Texas Rangers claimed Edgar Olmos off waivers from Seattle Mariners. February 13, 2015 Seattle Mariners designated LHP Edgar Olmos for assignment. November 20, 2014 Seattle Mariners claimed LHP Edgar Olmos off waivers from Miami Marlins. September 29, 2014 Miami Marlins recalled LHP Edgar Olmos from New Orleans Zephyrs. August 9, 2014 Miami Marlins optioned LHP Edgar Olmos to New Orleans Zephyrs. August 8, 2014 Miami Marlins recalled Edgar Olmos from New Orleans Zephyrs. May 28, 2014 LHP Edgar Olmos assigned to New Orleans Zephyrs from Jacksonville Suns. March 17, 2014 Miami Marlins optioned LHP Edgar Olmos to Jacksonville Suns. September 30, 2013 Miami Marlins recalled Edgar Olmos from Jacksonville Suns. June 18, 2013 Miami Marlins optioned Edgar Olmos to Jacksonville Suns. June 3, 2013 Miami Marlins recalled Edgar Olmos from Jacksonville Suns. March 11, 2013 Miami Marlins optioned Edgar Olmos to Jacksonville Suns. November 20, 2012 Miami Marlins selected the contract of Edgar Olmos from New Orleans Zephyrs. August 31, 2012 Edgar Olmos assigned to New Orleans Zephyrs from Jacksonville Suns. August 2, 2012 Edgar Olmos assigned to Jacksonville Suns from Jupiter Hammerheads. April 16, 2012 Edgar Olmos assigned to Jupiter Hammerheads from Jacksonville Suns. April 14, 2012 Edgar Olmos assigned to Jacksonville Suns from Jupiter Hammerheads. April 5, 2011 Edgar Olmos assigned to Jupiter Hammerheads from Greensboro Grasshoppers. April 2, 2010 Edgar Olmos assigned to Greensboro Grasshoppers from Jamestown Jammers. September 4, 2009 Edgar Olmos assigned to Jamestown Jammers from GCL Marlins. June 23, 2009 Edgar Olmos roster status changed by GCL Marlins.